The micrometer helped to create accuracy in modern manufacturing. 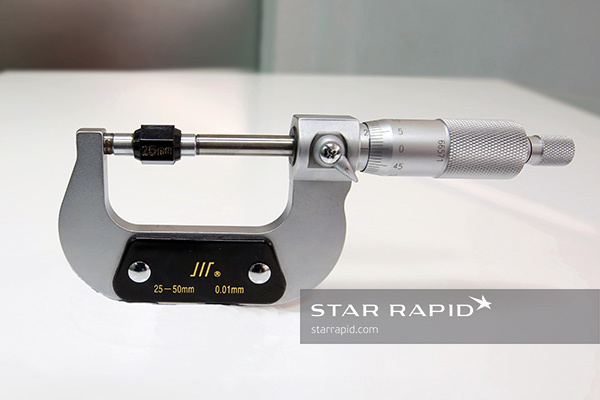 A micrometer is a sensitive tool for making accurate measurements of linear dimensions. It’s one of the most important measuring instruments ever made. It has a rigid C-shaped frame. One side has an anvil that is fixed, and on the other side is a moveable spindle. The feature to be measured is placed between these two and the thimble is rotated to close the spindle. Markings on the sleeve and thimble, called a vernier scale, show the exact physical dimension of the feature. Are micrometers a substitute for digital measurements? Micrometers and other analog instruments are additions to modern digital laser and optical measuring systems, but not substitutes for them. Each has their place in a modern factory, and when used properly their relative strengths can augment one another. Since it’s not practical to have a 3D laser scanner at every workstation when making a new rapid prototype or production part, we believe that good machinists must have a solid grounding in proper metrology practices to confirm the quality of their work. 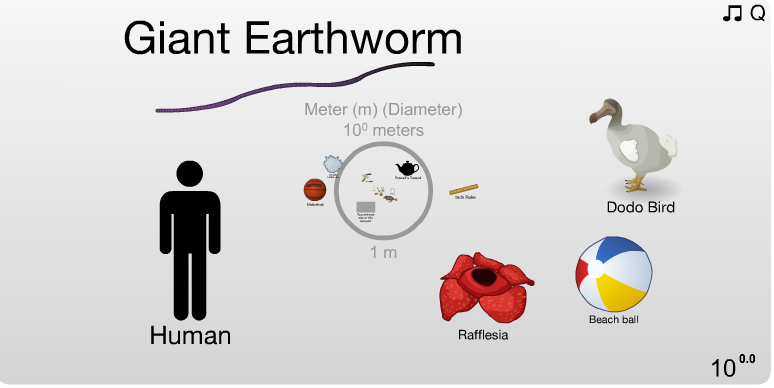 That’s where a micrometer comes in. Anatomy of a typical micrometer. How Is a micrometer read? The digital readout helps to confirm the reading on the vernier scale. 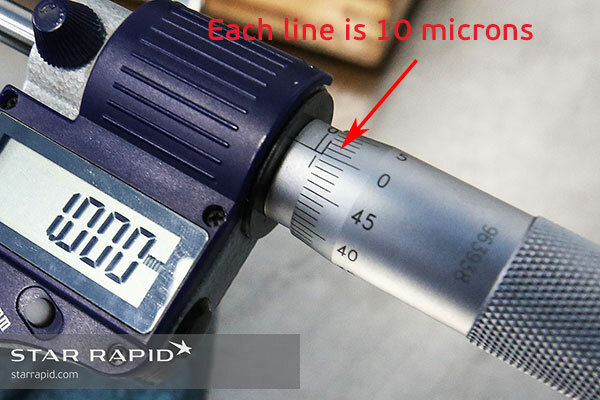 Although they can be calibrated in many ways, most machinists will measure in microns, or thousandths of a millimeter. On the above micrometer, each line on the thimble represents 10 microns, or ten-thousandths of a millimeter. The larger hash lines on the sleeve represent one-half of one millimeter, or 500 microns. 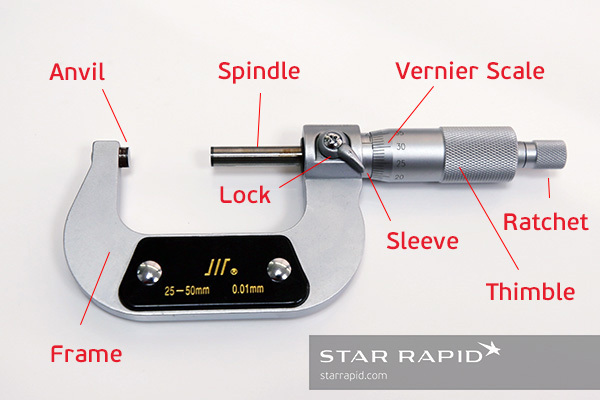 What is the proper way to use a micrometer? Machinists need to learn more than just how to properly read the calibrations on the micrometer. To use it correctly, they must also learn to hold the part carefully, ensuring that features to be measured between the spindle and anvil are in correct alignment with the frame of the tool. 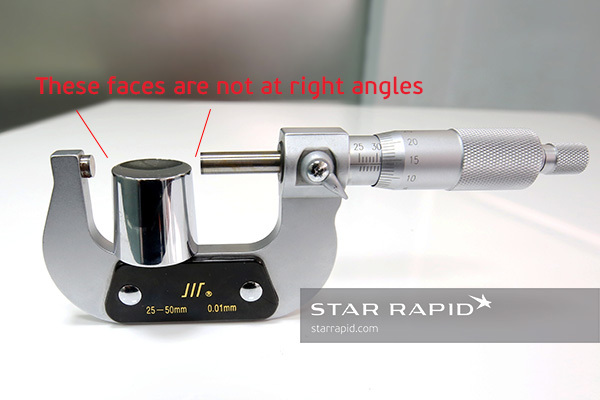 A micrometer is not suitable for measuring angled faces like these. This is easy to do with perfectly square, flat faces. It becomes more difficult with oddly shaped geometries. Micrometers cannot be used with some angled surfaces, so the machinist needs experience to know how best to use this instrument. How much pressure should be applied in measurement? Another skill that machinists must acquire is knowing how much pressure to apply between anvil and spindle. The ideal is to take up any slack or free space, so that an accurate measurement can be made. Too much pressure, however, can potentially cause thin-walled parts to bend or distort. This can also damage the precision instrument. 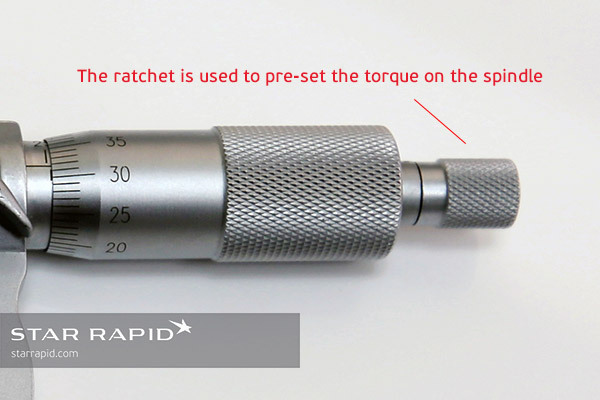 Ratchets help to ensure consistency from one measurement to the next. Some micrometers have a ratchet as part of the thimble. This allows the user to pre-set a degree of tension into the thimble so that it reads with a consistent pressure from one measurement to the next. Why Is this important for training skilled machinists? 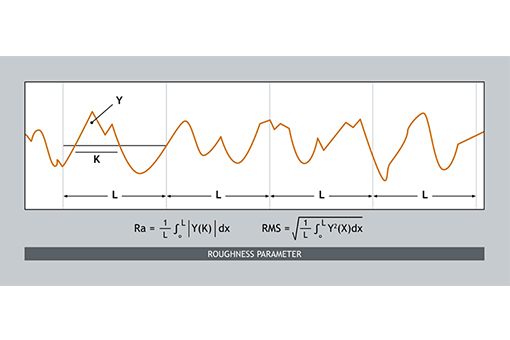 Making proper analog measurements is critical for achieving precision. Remember, accuracy and precision are related but not the same. Precision requires consistency, so we train our operators in best practices to yield consistent results. Using a micrometer properly assures the quality of your parts, saves costs, avoids waste or rework, builds careful work habits and enhances the analytical and spatial reasoning needed of superior engineers. That’s why at Star we teach all of our machinists to use a micrometer the correct way. How does this help to improve the quality of your parts? Since it is not practical to make 3D optical measurements of all parts at all stages of production, it is therefore necessary that our technicians constantly check and confirm the quality of their work. Micrometers are invaluable for spotting potential errors before a part reaches final quality inspection. This gives you confidence in the quality of your finished parts when you upload your CAD files for a free quotation.